When running short on time it can be difficult to eat healthy every day. Whether you’re working the 9-5 daily grind, or you’re a busy parent shuffling kids to and from school and activities, you can never have too many time-saving meal tips. So here are a few of our favorite meal preparation tips that will make your life easier. You’ll never look at Mondays the same again! Plan ahead: give yourself 1 hours at the beginning of the week to make a weekly meal guide. Map out what you’ll be eating every day for the next 5 days. Make sure each meal has fiber packed fruits or vegetables, a healthy amount of fats and carbs, and a good amount of protein. If you need some inspiration, visit our Healthy Recipes Pinterest board! 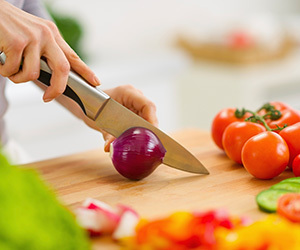 Get acquainted with your kitchen tools: there are lots of kitchen gadgets and appliances that are designed to make meal prep a breeze. From crockpots, to food processors, to even your microwave, you probably already have most of these items in your kitchen already. Make it pretty: you’ll be so excited to eat your prepared meal when it’s housed in a nice container. If you have a combination of food items, look for a reusable container that has separate sections to help divide it up. Either way, use a container that easily holds your entire meal in a neat and secure way. Don’t forget to pack utensils in case you’re noshing on-the-go! A huge obstacle to eating healthy is often a mind-over-matter issue, more than a time issue. Getting into the habit of being proactive when it comes to preparing your meals ahead of time will require a commitment. It’s time to prove to yourself that you can and you will savor sweet success.